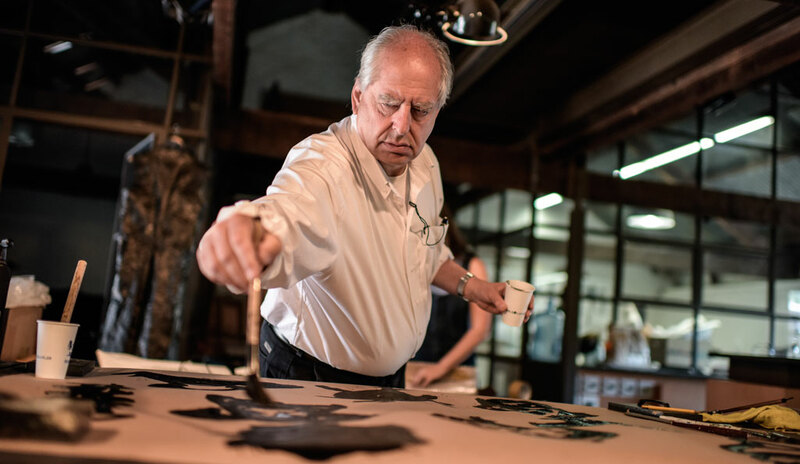 This was the year in which William Kentridge’s (b. 1955) public profile, in this country at least, caught up with his vaunted critical reputation. One catalyst for that shift was a major exhibition of the artist’s work at Marian Goodman Gallery – remarkably the first of its kind in London for over 15 years – which revealed the exceptional range of an artist whose printmaking, drawing, animation, theatre, and film has followed its own unique path, irrespective of contemporary fashions, over the past 25 years. More Sweetly Play the Dance (2015), the work that gave the exhibition its title, is indicative of the South African artist’s expressive style, of his political engagement and technical accomplishment: a 45-metre-long video projection, running across eight floor-to-ceiling screens, across which shuffle a desolate procession of silhouetted figures in a combination of shadow puppetry, film, and music. Merely entering the space was an overwhelming experience, yet once one had adjusted to the theatrical grandeur of this ‘filmed drawing’ it was impossible not to call to mind the long lines of Syrian and Afghan refugees walking up European beaches. This combination of aesthetic affect and oblique social commentary is typical of Kentridge’s work, in which politics is only one part – albeit an inseparable one – of a world defined by love, loneliness, and the relationship of the individual to society. The recent confluence of domestic political discourse with the artist’s long-standing interest in themes of displacement, social justice and colonial history goes some way to explaining why his work feels so urgent in the Europe of 2015. It’s been a busy year for Kentridge: alongside the Marian Goodman show, there was a major exhibition of new work at the EYE Filmmuseum, Amsterdam. He also contributed a major work to this year’s Istanbul Biennial, curated by Carolyn Christov-Bakargiev (who commissioned his acclaimed film The Refusal of Time for her 2012 edition of Documenta), and it is testament to the broad appeal of his work that the extraordinary multipart lithograph Remember the Treason Trial (2013) was shortlisted for the Charles Wollaston Award (for ‘most distinguished work’) at the Royal Academy’s Summer Exhibition. He was also elected an Honorary Royal Academician at that same London institution. Most recently, he followed his 2010 production of Shostakovich’s satire The Nose at the Metropolitan Opera in New York – which was rapturously received by art and music critics – with a new version of Alban Berg’s Lulu at the same venue, lauded by the New York Times as a ‘stunning and searing production’ of an ‘ingeniously structured, grimly beautiful work’. That Kentridge can make a success of such tangled material reveals the talent of an artist who has maintained a balance between the personal and political, between art as individual expression, and his own profound commitment to social justice. In 2016, London’s Whitechapel Gallery will stage a large-scale solo show of the artist’s work. The son of two prominent lawyers in the campaign against apartheid, Kentridge has never surrendered to a single, easily identifiable dogma. This complex, complicit understanding of politics is perfectly articulated in the palimpsestic approach he takes towards his animated films, each frame depicting a slightly amended version of the same drawing on a single piece of paper. The composition evolves through the narrative, typically bearing traces of previous scenes which have not entirely been erased. These works, new examples of which were exhibited at Marian Goodman, embody the processes that have been at work in South African (and Balkan, and Russian, and Chinese, and European) society over the course of his 60 years: the past remaining perceptible in the film even after it has been erased. Nothing is, or can be, entirely forgotten; history is written upon a single material, the new merely overlaying the old. That we cannot abrogate responsibility for the past has rarely been clearer than in the course of this past year. Indeed, it might simply be that the times have caught up with Kentridge’s conflicted, absurdist, ambivalent vision.